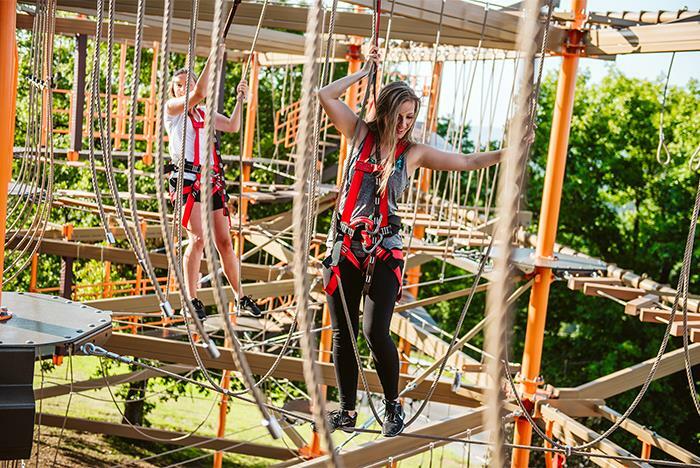 Discover your adventurous side on The Shepherd of the Hills’ brand-new Ropes Course. 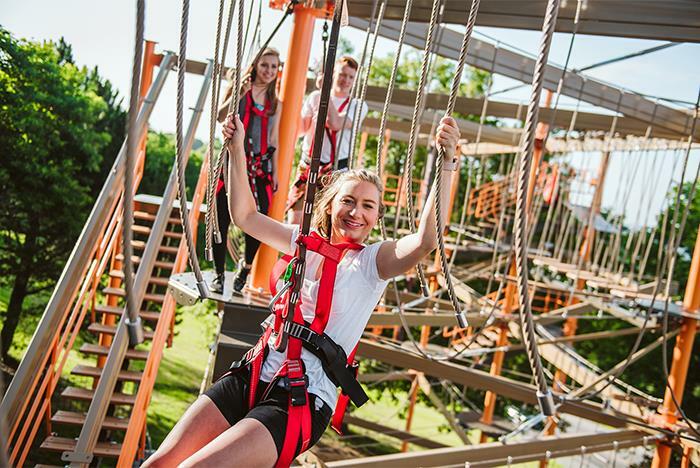 Featuring several obstacles and activities, families and solo-explorers can take in the jaw-dropping views of the Ozarks while conquering station after station. 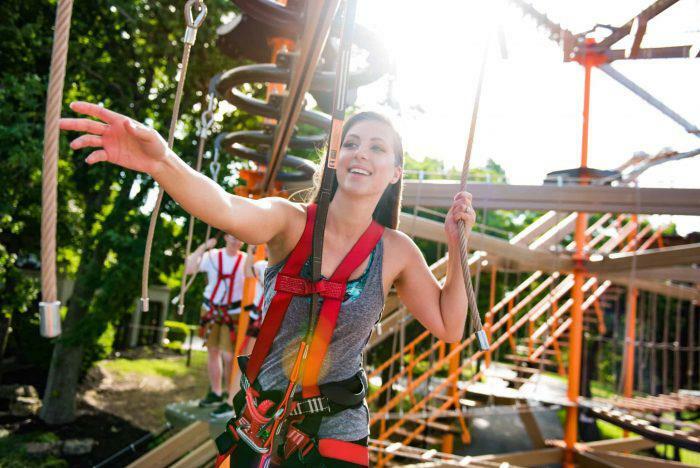 The Ropes Course is located next to the legendary Inspiration Tower, providing remarkable views and fun in Branson, MO. Cell phones are NOT allowed on attraction. Must wear closed toed shoes and comfortable attire. Located at The Shepherd of the Hills in Branson, MO. Only 1 participant on activity at a time except if the child is being assisted by a responsible chaperone. Open from 10:00 am to 6:00 pm daily. Adventure awaits for families or solo-explorers on The Shepherd of the Hills’ all-new Ropes Course. This outdoor structure stands tall next to the iconic Inspiration Tower and boasts the same incredible views coupled with an exciting ascent. • Must be able to understand and demonstrate knowledge of all safety rules and the course environment to experience the attraction without a responsible chaperone. • Participating while under the influence of drugs or alcohol is prohibited. • Cell phones are NOT allowed on attraction. • Maximum weight is 300lbs (136kg). • Must be 48 (122cm) tall to participate without a responsible chaperone. • Must safely fit in the harness. • Ensure that shoes are secure. No flip-flops or open heel shoes. Make sure shoelaces are tied. • Pockets must be empty. No loose objects such as cell phones or cameras. • Eyeglasses should be secure. Operators are not responsible for lost or misplaced personal items. • No gum, food or drinks allowed on attraction. Follow all operator instructions, posted rule signs and stickers. • Only 1 participant on activity at a time except if a child is being assisted by a responsible chaperone. • No running, jumping, hanging in harness or horseplay. Operators reserve the right to expel participants displaying these behaviors. • The redundant sling line should stay in front of and between shoulders at all times. • Do not touch the overhead tracking system or tamper with the harness or redundant sling line. Must be under 48" and accompanied by an adult. Must be able to walk unassisted. No minimum height as long as they can fit safely into the harness. No age requirements. Tickets can be purchased at the venue for the Little Tykes Course. Wear closed toed shoes and athletic attire. Ensure that shoes are secure. No flip-flops or open heel shoes. Make sure shoelaces are tied. Pockets must be empty. No loose objects such as cell phones or cameras. Eyeglasses should be secure. Operators are not responsible for lost or misplaced personal items. Can I bring a camera or cell phone on the course? The Ropes Course is open from 10:00 am to 6:00 pm daily. Is there a height or weight restriction in place? Yes. Guests must not exceed the maximum weight of 300 lbs (136kg) and must be at least 48″ (122cm) tall to participate without a responsible chaperone. There is a Little Tykes course available for those under 48”. No gum, food or drinks allowed on attraction.